It's a truth universally understood that space – especially within a busy, popular city – is eventually going to come at a premium as its population swells. The case is certainly true in Singapore, an island (and city) with limited room to move: while contemporary home development is desirable, having the adequate space to build, and build well, is a tricky negotiation. Developers these days have been tackling Singapore's space limitations by getting smart about it, by designing innovative, stylish and stunning modern homes that are also relatively compact. 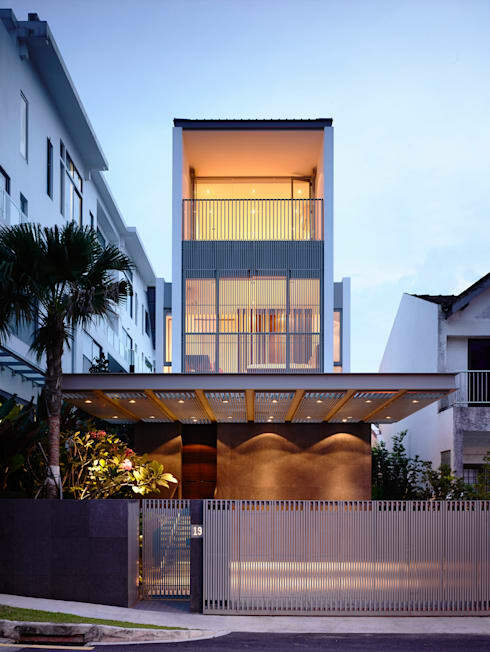 This fabulous dwelling, designed by Hyla Architects, is a watershed piece for modern Singaporean design, exemplifying this necessary blend of stylishness with space-consciousness. On a relatively meagre block of land, the designers have created a stunning yet spacious contemporary dwelling: a sleek home for those looking to live the high life in one of the world's busiest cities. If you would like to take a look inside this intriguing property, check out the images below, and get some inspiration for your abode! The façade of this home is impressive and striking. 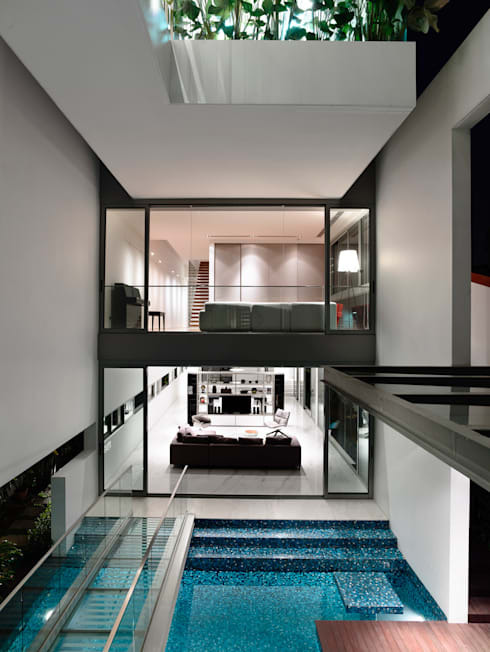 Situated next to some standard and typical Singaporean architecture, the dwelling really makes a statement. The house features finely detailed screens, which conceal the residence that is gently nestled into the garden. The entrance is elevated above the ground, and the front door is reached via a few steps that lead up towards a sleek wall and entry. The appearance of the residence is one that is long, lean, and linear. It appears slim, and works with its delicate yet imposing frame to create a bold and lively structure. As we move inside the home, we are greeted by, what has to be one of the most amazing indoor/outdoor pools, which we have ever seen! The superb spiral staircase leads the occupant onto the glass bridge, and provides an unbelievable view of the entire space. There is small living space to the left, with a gorgeous upholstered lounge chair, and a stunning cantilevered lighting panel. In addition, the colour scheme is a bright white hue, which works wonderfully with the contrasting greenery, and chic turquoise of the pool. Taking a look from the other perspective, we are able to see the wonderful design of this exquisite abode. The glass bridge connects the entrance of the home with the main living spaces, and throughout we see a glorious abundance of glazing, which adds to the stylish airiness of the home. The colour scheme inside is predominantly monochromatic, with whites and blacks used to create a sleek contemporary aesthetic. 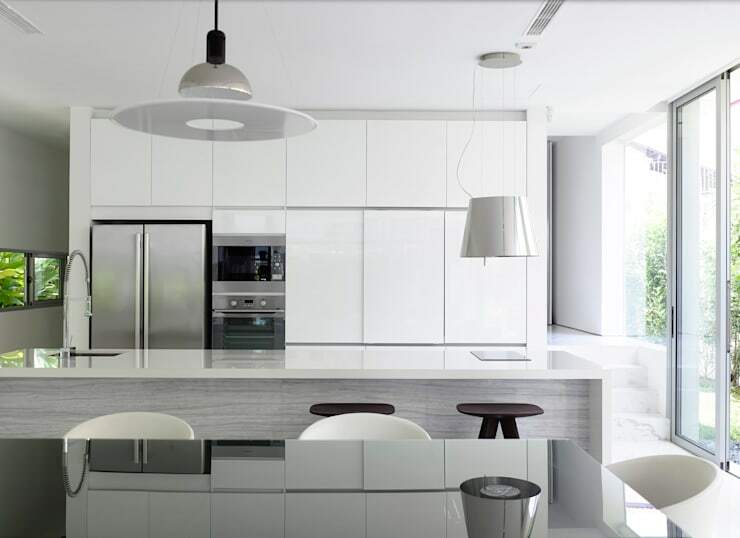 A sleek white kitchen – is there ever a space that evokes a move clean and crisp aesthetic? We don't think so. This stunning cooking space is replete with bespoke joinery, and a high gloss finish. The room combines elements of modernity with traditional design. The result is a space that oozes appeal and style, with an opulence that is rarely seen in such an understated fashion. The appliances are stainless steel, adding to the chic monochromatic ambience, while handing pendant lights bring illumination into the room with ease. Above the pool space, and within the living areas, we see a truly wonderful and neutral area of rest and relaxation. 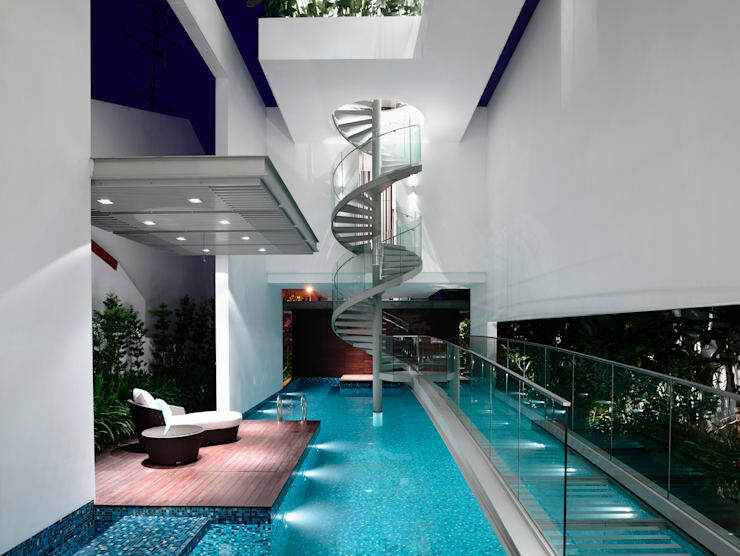 The muted hues impart serenity, while the vista is the spiral staircase that extended from the entry. Sliding glass doors can be closed across the space, ensuring a little peace and quiet while others are in the pool area. When this is open, the room enjoys a cohesiveness with the other domestic spaces, and invites the occupant to connect with the structure as a whole. If you need some help with your interior decorating, you can always chat to a professional to achieve your desired look and aesthetic! This house is ultra-contemporary, and yet, manages to combines elements seen in the everyday environment into the interior spaces. Greenery is implemented with astute confidence, and gives the areas a burst of life and vivacity. Timber accents are again yet another way for the house to achieve an integration with nature. The spaces are harmonious, and inject a sense of cool, calm collectedness. 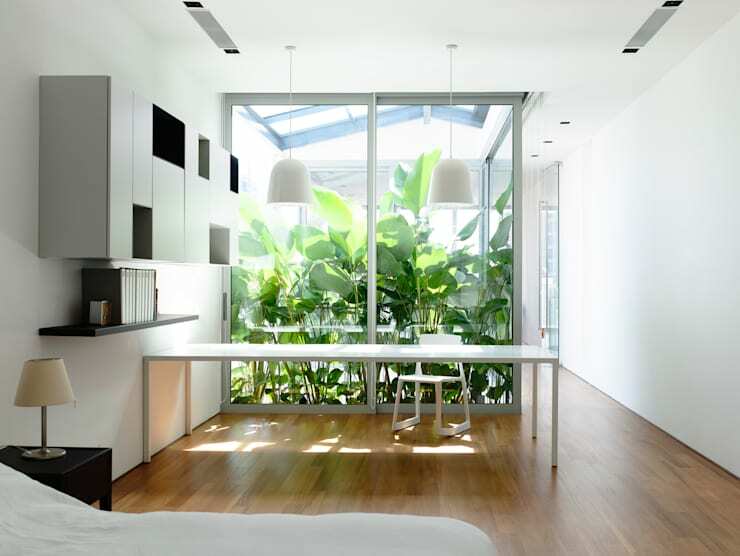 This entire room is the epitome of stylish and sophisticated Singaporean design. It evokes a sense of nonchalance, while working with the surrounding environment, and not against it. From another vantage we are given an insight into the high level of attention-to-detail, which has gone into almost all aspects of this dwelling. The cabinetry here is a bespoke design, adding to the modernity of the house, while providing essential storage for the home office space. 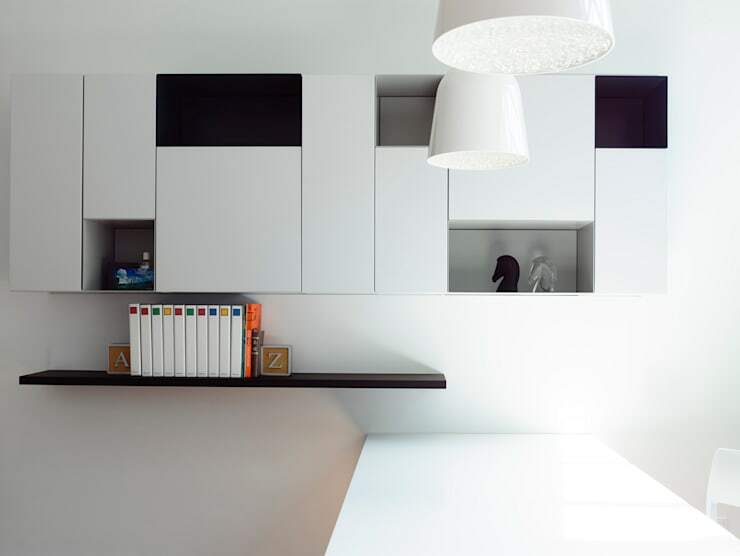 The shelving and joinery are white, with black sections adding contrast and interest to the overall space. A single shelf holds books, and imparts practicality, while looking effortlessly graceful. The timber accents are particularly visible within the interior of the home. 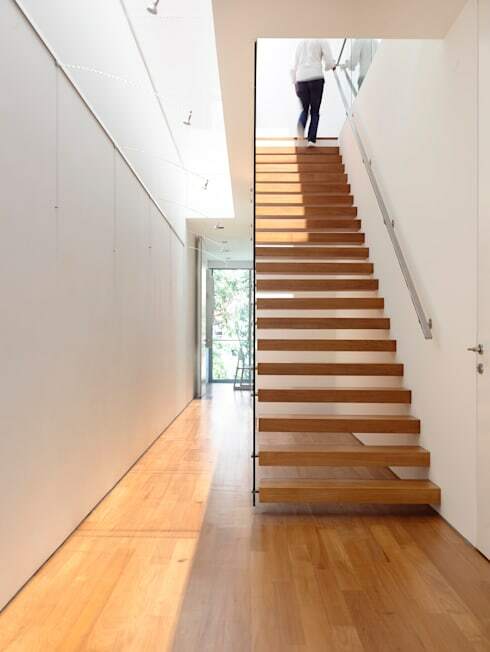 This staircase utilises this medium-light wood to ensure the space that is inviting, stylish, and connected with nature. Additionally, there is a long roof light that injects natural illumination into the corridor, and works wonderfully within the home. Its long form coordinates extremely well with the matching length of the hallway, and offers highly satisfying symmetry for the interior space. 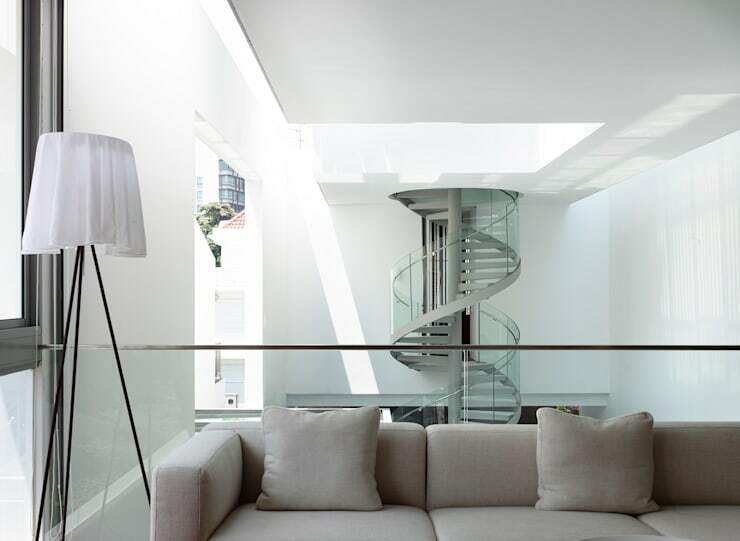 The staircase is partly see-through with the steps separated allowing the light to filter through, and ensuring the space feels open and spacious. A large volume of architecture in Singapore works against the surrounding environment as opposed to enhancing the landscape with helpful and harmonious design. Good design in this instance means taking elements from nature and implementing them into the home to create a stylish, timeless, and sympathetic interior. Take a look at this striking bathroom. The space is replete with a host of unbelievable features that create a space of luxury, lavishness, and comfort. 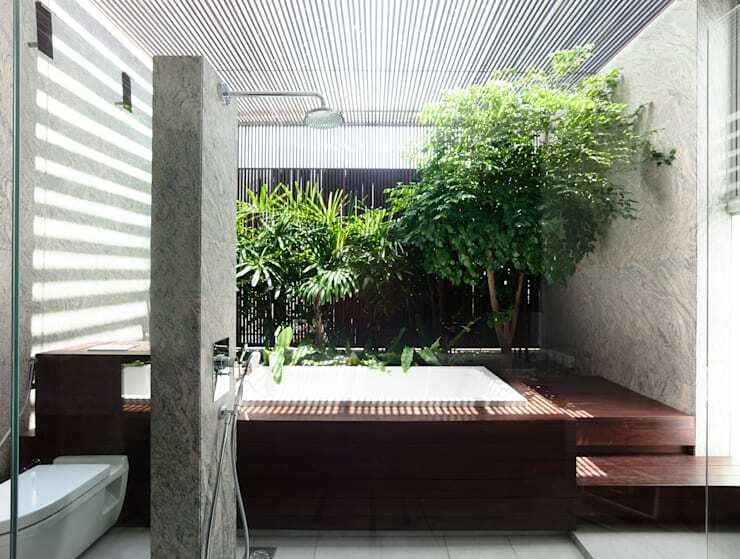 The standout element is a large spa bath that is flanked by a range of differing greenery. This timber encased tub works wonders to infuse the area with warmth, simplicity, and understated panache.